Three years ago, Kendall native and New World School of the Arts Alumna Elaine Álvarez was a promising 26-year-old opera singer, auditioning every chance she could for young artist programs, potential agents, opera companies for main stage roles, and money-granting competitions. In October 2007, everything changed. Ms. Álvarez had been hired by the Lyric Opera of Chicago to be the understudy for the role of Mimì in Puccini’s La bohème. The singer booked for the role of Mimì was Metropolitan Opera favorite Angela Gheorghiu. In a fortunate twist of fate, and in pure dramatic opera fashion, Ms. Gheorghiu was publicly fired by the Lyric Opera just days before opening night. Ms. Alvarez stepped in and wowed the audiences and critics alike. Said the Chicago Tribune: “Álvarez looked and sounded like a poised veteran…[she] saved the day, and then some.” The Chicago Sun-Times called her singing “juicy and lyrical.” Ms. Álvarez has been in demand ever since, singing all around the world. Elaine Álvarez’s Florida Grand Opera debut was Saturday, April 24, as Micaëla in Bizet’s Carmen. Florida Grand Opera kicked off its 69th season on November 14th with the exciting double bill of Pagliacci and Suor Angelica. Opera lovers packed the house to witness the return of FGO favorite Kelly Kaduce, singing the lead in both operas. Marking her 6th appearance in Miami, Kaduce was also seen on the Ziff Ballet Opera House stage in 2007 in the title role for the world premiere of Anna Karenina. Jay Hunter Morris & Kelly Kaduce in FGO's Pagliacci. Photo by Gaston De Cardenas. Anniversaries and debuts also mark FGO’s new season. Robert M. Heuer celebrates his 25th season as General Director & CEO, and only the 3rd director in the company’s history. Victor H. Mendelson begins his first season as President of the Board of Directors, though his family is no stranger to FGO: He represents the fourth generation in his family to support the company. Jane A. Robinson enters her first season as Chairman of the Board of Directors, following five years as president. 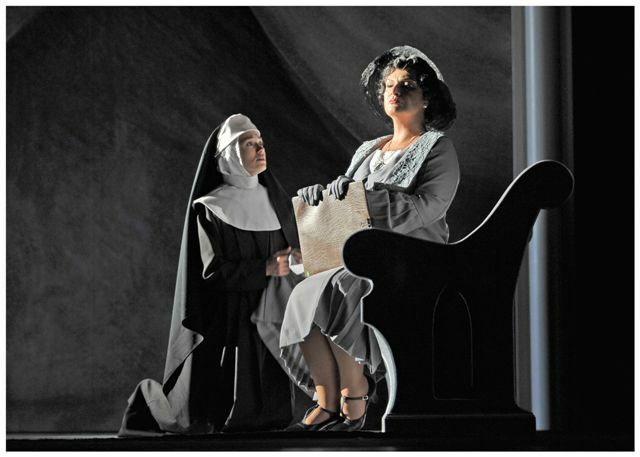 Kelly Kaduce & Mzia Nioradze in FGO Suor Angelica. Photo by Gaston De Cardenas. Three new key management positions were filled this past summer, all poised to make their first season a spectacular one: Brendan Glynn is the new Director of Marketing, following a successful tenure as the marketing chief at the Broward Center; with previous posts at the Metropolitan Opera and LA Opera, Peter Somogyi is now the new Director of Artistic Administration; Lisa Bury, with a career highlighted by 10 years at the Lyric Opera of Chicago, is the new Director of Development.. The 2009-2010 Season also opened on a bittersweet note. Long-time Miami arts philanthropist and champion, Don Carlin, passed away on November 11th. Carlin gave generously to Florida Grand Opera for many years, and his support was instrumental in the building of the Adrienne Arsht Center. The November 14th performance was dedicated to his memory. Now entering its 69th season, Florida Grand Opera has announced a new slate of leaders for its Board of Directors. Victor H. Mendelson was elected president of the Board, succeeding Jane A. Robinson, who was elected chairman of the Board of Directors following her five years as president. Victor H. Mendelson represents his family’s fourth generation of Florida Grand Opera supporters, which began with his great-grandmother Lillian Brown, and continued with his grandmother Muriel Hattenbach, and his mother Arlene H. Mendelson. Mr. Mendelson is the president and chief executive officer of HEICO Electronic Technologies Corp., a subsidiary of NYSE-traded HEICO Corporation. He is a member of the Board of Visitors of Columbia College in New York City, a trustee of St. Thomas University, and held the FGO Board of Directors office of treasurer from 2007 until May of 2009. Florence Hecht and Leonard Robbins were elected directors emeriti in recognition of their many years of service and support of the Opera, and James M. Herron was re-elected as the Opera’s representative to the Arsht Center Trust Board. Newly elected to the Florida Grand Opera Board of Directors are Leatrice Taylor Damus, Morton J. Robinson, M.D., Gale Goldstein Tucker, Esq., and Ana Moran Varela. Florida Grand Opera closes its season at the Adrienne Arsht Center with Puccini’s Madama Butterfly (April 25 through May 9.) The opening-night after party was held this past Saturday in the Peacock Foundation Studio. In attendance among the elegant black tie guests were: Robert M. Heuer, General Director/CEO of Florida Grand Opera, Dr. and Mrs. J. Morton Robinson (Jane Robinson is President of the Board of Directors of FGO), Board member Robert Gang and his wife Adrienne (Mr. Gang’s law firm, Greenberg Traurig were partial production sponsors), Crown Jewel members, Randy Gage, Ralph Lutrin of the Audrey Love Charitable Foundation and Mr. and Mrs. Roger Sturgeon – Isobel Sturgeon looking stunning in a red satin Madama Butterfly gown created by local couture fashion designer, Yoly Munoz. Also spotted at the party were socialite philanthropists Ruby Bacardi, Ana and Alvaro Varela and Dr. and Mrs. Sanford Ziff (of the Ziff Ballet Opera House). The event paid a special tribute to Maestro Stewart Robertson, stepping down at the end of this season after 11 euphonious years as Music Director and Conductor at Florida Grand Opera.